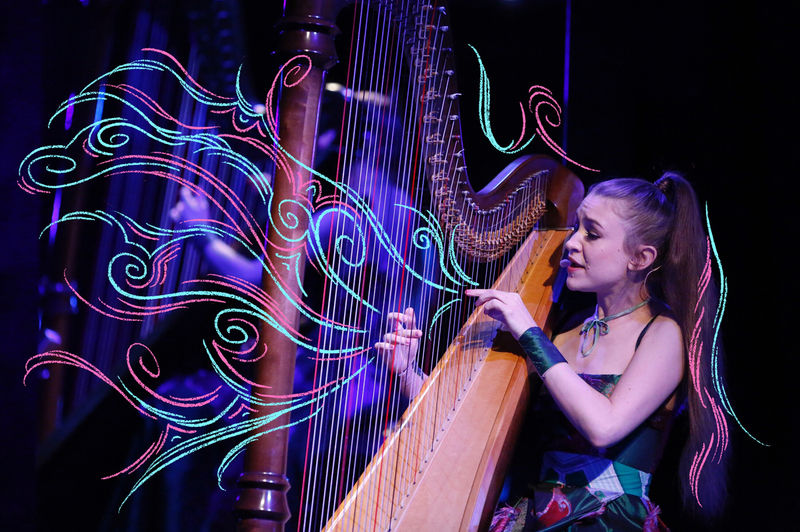 Joanna Newsom Is The 21st Century's Timeless Voice An expert composer, Newsom challenges the independent music world's standards for feminine voices. Her music offers a particular gift, inspiring listeners to get lost on their own journeys. Joanna Newsom performs on Late Night with Seth Meyers on March 16, 2016. Like the multi-layered metaphors and double-meaning wordplay that laces her lyrics, in Newsom's world, rare and rich dualities exists. She shouts, screeches, creaks and coos. And yet this is all entwined within her distinct femininity: her high-pitched inflection, masterful harp playing, epicly emotive lyrics and intuitive writing. There is a sense that she is following her voice where it goes, but she goes there gracefully and attentively, matching her syllables with the most emotionally suited turns in her voice. With her gritty girlishness that critics have often infantilized, she's also an arbiter of wisdom, of expertly crafted folk songs rich in metaphor and mythology, and an expert composer. Throughout her discography, her deep love of history and literature has shaped a collection of poetry that stands up on its own on the page — words that jump with the alternatingly chilling, pensive and glistening presence of her harp, her lines syncopating with the plucks and hums of the strings. She bridges folk traditions with enormous arrangements for concert halls. "Am I so dear? Do I run rare?" she asks near the end of "Peach Plum Pear," one of the more immediately affecting songs from her 2004 studio debut The Milk-Eyed Mender. Stretching each of those last two words, the questions come amid her pondering of a soured romantic interest — "You've changed some / water runs from the snow," she shout-sings earlier in a choir of one, enchantedly reflecting on the slow fading of what was. But as she sings over a bright, sticky harpsichord loop, these two simple questions seem prescient of ones she'd likely consider as the music world grew shook and split by her beautifully unusual work. "Emily" is an ode to Newsom's astronomer sister, but also more generally to sisterhood, family, memory, love, loss. It's told through a winding series of memories and vignettes where Emily and Newsom watch birds and skip stones; Emily teaches her about the stars, and in the song's second half, cares for her in times of intense difficulty. "I've seen your bravery, and I will follow you there / and row through the night time / so healthy," Newsom sings. When Emily eventually moves away, and Newsom shouts for her to "come on home," it is quietly devastating. In Newsom's world, there are songs within songs, places to get lost in. There's a reason Newsom calls her most dedicated fans "the delvers" — this is music for close, careful listening; for delving, not background sound. These are songs that resonate most strongly within the environment that Newsom crafts on each album, whereas streaming playlists strip music from its context. To begin unpacking the scope of what Newsom is raising up here requires not just careful listening, but a willingness to follow the threads she has provided—to decode her references to poems and paintings and political figures and lore. The beauty in Newsom's music is often in how she strings together these tremendous portraits that have the ability to transport listeners to different places in space and time, not by teaching, per se, but providing a map with which listeners can teach themselves.